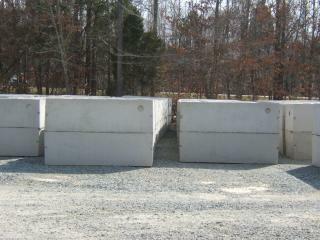 Why Should I Choose a Precast Concrete Septic Tank? 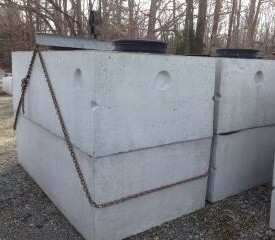 Precast concrete septic tanks are known for their superior strength, durability and ease of installation--not to mention they are a “Green” product. 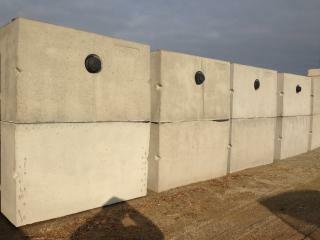 Precast concrete septic tanks will outperform and outlast competing materials by their advantages in load bearing abilities, being impervious, longevity and being economical saving you money up front and years to come. The 1,000 gallon septic tank has sufficient capacity to process effluent flows from a one bedroom to a four bedroom single family residence. Larger capacity septic tanks with liquid capacities exceeding 1,500 gallons are installed where wastewater flows exceed the discharges that would typically be generated by a four bedroom maximum single family residence. 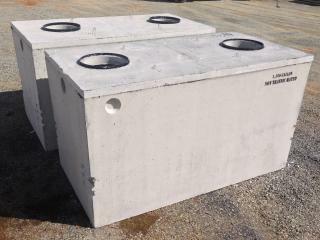 Shoaf precast manufactures a variety of quality precast septic tanks in various sizes to meet most every application. At Shoaf Precast we understand the phrase "time is money" especially in the construction industry. That is why we pride ourselves on our ability to deliver your products fast, keeping the job moving forward. With our team of dedicated and experienced drivers along with a large fleet and variety of trucks; we are able to keep the ball rolling so you can be from one job to the next. We were built on hard work and honest business values and that is the way we will continue to grow. 480 Gal. N/A 4,200 5 ft. 5 ft. 66" 54" 52"
1,000 Gal. STB-760 8,500 10 ft. 5 ft. 66" 54" 52"
1,000 Gal. 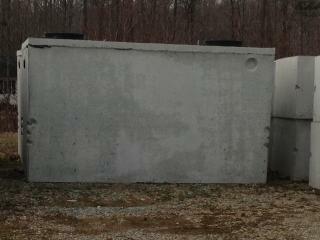 (Low Profile Rock Tank) STB-157 11,000 13 ft. 7ft. 53" 42" 40"
1,200 Gal. STB-806 10,500 10 ft. 6 ft. 72" 60" 58"
1,250 Gal. STB-299 11,500 13 ft. 7 ft. 61" 50" 48"
1,500 Gal. STB-964 12,000 13 ft. 7 ft. 70" 58" 56"
2,000 Gal. STB-56 16,000 15 ft. 8 ft. 68" 57" 55"
2,500 Gal. 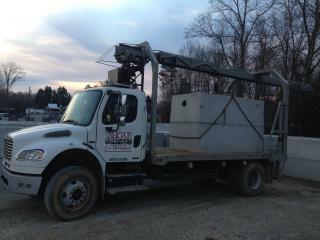 STB-276 18,000 15 ft. 8 ft. 74" 63" 60"
3,000 Gal. STB-186 20,000 15 ft. 8 ft. 82" 69" 67"
240 Gal. N/A 2,400 5 ft. 5 ft. 36" 25" 25"
1,000 Gal. STB-347 9,500 10 ft. 5 ft. 67" 57" 55"
1,250 Gal. STB-389 11,000 13 ft. 7 ft. 62" 50" 48"
1,500 Gal. STB-390 13,000 13 ft. 7 ft. 71" 59" 57"